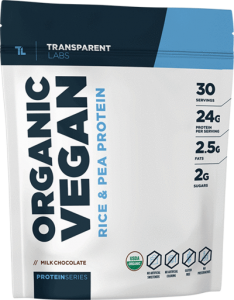 As one of the best sources of nutrition for protein, the Vegan Rice & Pea Protein Powder from Transparent Labs offers a great nutrition supplementation every day. The powder is made for vegans or people who are looking to replace other animal-based proteins. The product stands out with its purity and it can be one of the leading options when you are concerned about possible long-term side-effects. With no artificial colors and flavors, the protein is great for most people who are active. The protein powder is one of the options to consider for better muscle recovery and for improved overall muscle development as well. It comes as a pure formulation which combines two types of protein. Unlike animal-based proteins, vegan proteins are usually combined to offer an improved amino acid profile. This also means that they have the ability to offer a superior nutrient quality. Rice and pea protein can be one of the quality sources of protein which are usually used by active people. Those who play sports or who have intense physical training can use protein to improve muscle recovery. With a speedier recovery and improved nutrition to lay the foundation for muscle growth which is required to gain strength, the Transparent Labs protein is one of the great solutions to consider. Furthermore, it is also recommended to look at the options which allow you great overall results in terms of practicality. The protein powder can be consumed when mixed with liquids. Most people mix it with water but there are people who also mix it with milk as well. This is why it is important to know that depending on your goals, the protein powder can be consumed in different ways. If you need to lose weight, consuming the protein with water is recommended. At the same time, it is also recommended to look for the best times to do this and this is often right after workouts. If you want to grow your muscles, caloric intake is also recommended and this is why you can consume it with milk. If you are a vegan, almond milk or coconut milk are great alternatives to the cow’s milk which most people consume. Unfortunately, the protein only comes in two flavors. But the good news is that they are the most popular flavors in the segment. With vanilla and chocolate flavors, you can make your shakes tastier. 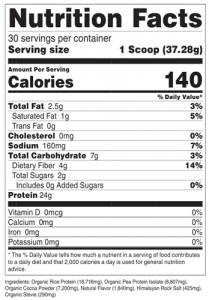 But at the same time, you need to consider the impact the flavors have on shakes which come with added ingredients. If you do not want to use the protein powder in shakes, some other options might also be available. You can mix the powder with your breakfast oats. You can also prepare different healthy sweets such as brownies or protein bars using the vegan protein powder. Its versatility allows you to consume it in different ways.